Happy Thursday! While Thursday is usually a pretty solid day (I mean, it’s closer to the weekend than Wednesday, right?) the end of the week can often be a little stressful. That’s why we depend on animals. Sure, petting a dog or a cat can help relieve stress, but even seeing videos or gifs of animals being adorable can help you get through the day. 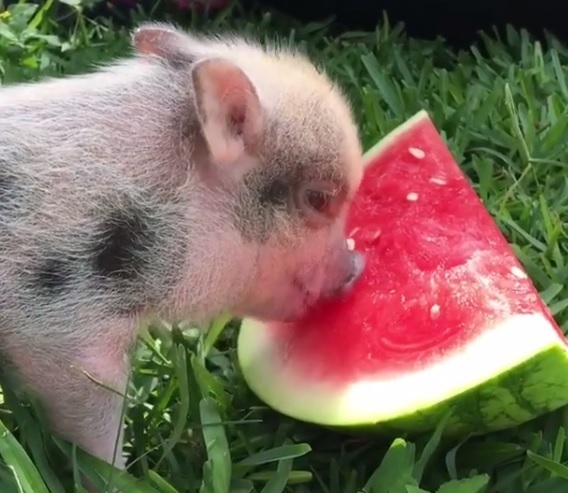 Case in point, this video that’s being heavily circulated of a little piglet noshing on some watermelon. The video is brought to us from Buck Wild Rescue in Ingram, Texas. It was so adorable that People reached out to the rescue for more information on the adorable pig, named Pixie. "We had to find the smallest bottle and we kept her alive by giving her fluids and medicated paste. Some nights we had to sleep in the clinic with her to make sure she made it through the night, despite her harrowing beginning she was always jovial and spritely," Buck Wild Rescue said to People. We’re so glad that Pixie the piglet found a place to enjoy life. We’re also glad she likes, quite possibly, one of the best fruits ever. Pixie definitely has good taste, that’s for sure.